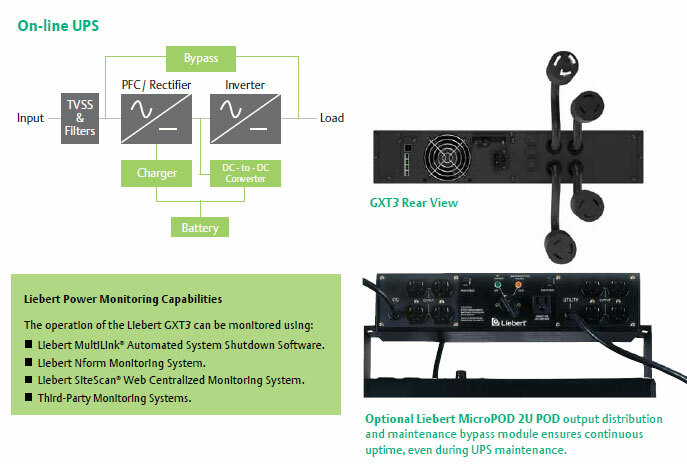 Liebert GXT3 true on-line uninterruptible power system (UPS) combines low cost of ownership with rich functionality, small size and high capacity. The UPS offers internal batteries, optional external batteries, and internal bypass capability, resulting in continuous uptime for the connected equipment. Designed for rack-mount or tower modes, the Liebert GXT3 uninterruptible power unit is just 2U high, and is available in 500, 700, 1000, 1500, 2000, and 3000 VA ratings, in both 120V and 230V models.